We have just released an updated version of our download portfolio feature. 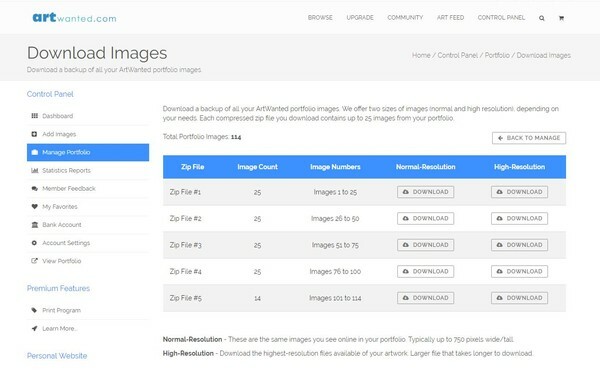 All members can now quickly download a backup copy of all the images in your ArtWanted portfolio. This feature was available on our old website, but has been updated and improved for the new website. Enjoy peace of mind that your artwork will not be lost in a hard drive crash or from computer theft. ArtWanted stores your artwork files, so they can always be downloaded if needed. Premium Members receive an additional benefit of high-resolution file storage of all the original files they upload. To download your portfolio images, visit your MANAGE PORTFOLIO page in your members CONTROL PANEL and click the download portfolio button at the top or bottom of this page. You can download your portfolio images in two different sizes and in batches of 25 image zip files. Enjoy!